At INTI we recognise the value of being different and do our best to offer our students an education that is individualised to their personal abilities of learning and development. We realise that every student carries a different and unique potential, and while some are born to climb the corporate ranks, others thrive outside of it. This is why we not only offer our students education, but the guidance they need to discover themselves, their passion and their potential. We recognise that as an institution of higher learning, one of the best things we can offer our students is clarity of purpose and vision when they take their first steps into their careers. Through a variety of activities such as competitions, events and programmes either at campus, national or international level, INTI helps prepare students by exposing them to valuable experiences, which guide them in making informed choices and discovering platforms to kick start their futures. The following highlights some key activities that has been carried out to help develop our students’ individual journeys. Organised together with Leadapreneur, an established organisation that offers online learning and leadership training, the EPIC Champions programme was developed with the intention to empower students in the areas of leadership, communication, critical thinking, collaboration, and management skills. With the help of facilitators, mentors and international trainers from UK and Switzerland, students gained insights into key skills that would help them in any career they chose to embark on. The added advantage of working with international trainers provided them also with international exposure, a crucial factor to better prepare students with meeting the increasingly global workplace. To gain real experiences from the experts, students were paired up with mentors from leading local and international corporations. Among those who have worked with us in building up our students’ confidence and knowledge were Malayan Banking Berhad (Maybank), PricewaterhouseCoopers (PWC) and Hewlett Packard (HP) Enterprise Services. 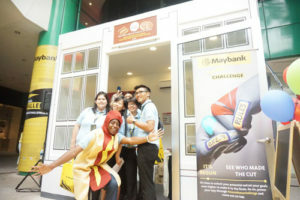 To many institutions of higher learning, the Maybank Go Ahead Challenge represents the same level of prestige and commitment as popular reality game show ‘The Apprentice’. An international business case competition that challenges students’ intellect, stretches their creativity and tests their endurance, the Maybank Go Ahead Challenge has seen increased participation over the last few years since its introduction. In 2015, INTI was among the biggest cohorts represented at the Nationals, sending a total of 12 students representing INTI International College Subang, INTI International College Penang and INTI College Sabah. It was a significant moment for INTI when Janice Low Ming Huey from INTI Penang, beat out more than 23,000 applicants to become our first representative at the Global Finals, competing with students from across 14 other countries. Janice successfully secured a position as one of the Top 20 competitors and was later offered a position in the prestigious Global Maybank Apprentice Programme. In addition to the great learning experiences they gained from the competition, students also took away new ideas and exposure from a full day training facilitated by the heads of the School of Business, Centre for American Education, Career Services and Corporate Marketing Offices at INTI Subang. A localised edition of the well-known World Entrepreneurship Forum, which are held globally in cities like Buenos Aires, Istanbul and Shanghai, the Junior World Entrepreneurship Forum (JWEF) Malaysia aims to create a powerful platform for networking opportunities for aspiring young local entrepreneurs. 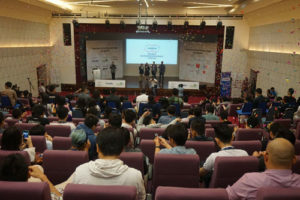 In 2015, JWEF Malaysia, which consisted of several workshop sessions and a two-day international forum was held at INTI International College Subang, as INTI was the main sponsor of the event. The workshops were aimed at developing entrepreneurial skills and exposing students to the realities of business. Through the guidance of a mentor, students were introduced to business simulation exercise, which uses a unique technological platform that allows them to create portfolios and compete with their fellow participants. There was also a business case competition that provided the opportunity for two winners to represent Malaysia at the World Entrepreneurship Forum. This year, one of the two winners selected to participate in the world Forum in Hangzhou, China was Isaac Liew, a postgraduate student from INTI International University. The two-day JWEF international forum brought together an impressive group of prominent entrepreneurs such as Yeoh Chen Chow, Co-Founder of KFit; Teoh Wee Kiat, Co-Founder of myBurgerLab and Jason Lo, CEO of Tune Talk, who shared valuable insights into the trends and outlook of the global business arena. This year’s forum was especially significant, as it saw INTI’s own Ganesh Muren, a Diploma in Mechanical Engineering student, and the founder and CEO of Saora Industries speaking at the conference. Ganesh is a budding social entrepreneur whose affordable water purification system is set to bring solutions to rural and marginalised communities.